Waiting for the ferry between Digby Neck and Long Island. 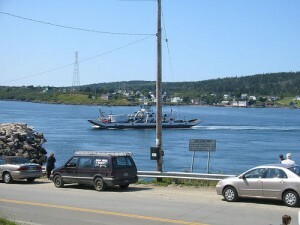 Regular ferries make the short hop from the end of Digby Neck to Long Island and Brier Island. The boats run hourly and around the clock. Fares are cheap – free for foot passengers and just $5 return for vehicles. The first sailing is from East Ferry, at the end of Digby Neck, to Tiverton, on Long Island, across a stretch of water called Petit Passage. Departures from East Ferry go every hour on the half hour. From Tiverton, it’s an 18km drive across Long Island to Freeport, where a second ferry takes you to Westport on Brier Island. Departures from Freeport are every hour on the hour. Ferries are timed so that if you drive straight across Long Island, you’ll arrive at Freeport just in time to catch the boat to Westport on Brier Island. If you stop, you’ll miss the boat and be delayed until the next sailing. Driving straight through, it takes about 45 minutes to get from Digby to the first ferry. Allow 2 hours from Digby to get to Westport in time for a whale watching cruise and more time on weekends or during peak season. The ferries are small so if there are many cars, you’ll have to wait your turn.